A tour of celebrations around the world through different time zones! The Savvy Newcomer is read in many countries, by translators and interpreters who work in many languages. As we consider Christmas and New Year around the world, we decided to explore some of those cultures by asking some of our translator and interpreter colleagues to take us on a selected world tour and see what and how they celebrate in different places. John Wan is our Chinese tour guide. It is GMT +8:00. For Chinese people, the holiday season refers to the time around the Chinese New Year, which is the first day of the first month on the traditional Chinese lunar calendar. By Western calendar dates, in 2015 it will be in February 19. The celebration ends with the Lantern Festival, which will be on March 5 in 2015. New Year’s Eve is a time for family reunions. That dinner is the biggest and most important one of the whole year. Abundant portions are prepared and served to symbolize surplus. A fish is always placed on the table, but no one is supposed to eat it. It is a reminder to be frugal so there will be a surplus at the end of the next year, because in Chinese, the words “fish” and “surplus” have the same pronunciation. Dumplings are a key dish. Their shape is similar to ancient gold ingots, signifying the ushering in of wealth and prosperity. After dinner, children receive a red package with money in it. Family members stay up together until midnight. The most common ways of making the time go by until midnight are playing Mahjong and watching the New Year’s Gala special on TV. Then, fireworks are launched to chase away evil. 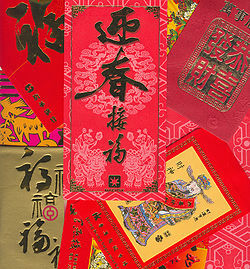 On New Year’s Day, people put on new clothes, visit each other and wish each other a prosperous year to come. On the 2ndday of the New Year, married women are supposed to return to their own parents’ home together with their husband, and hopefully several children. This is the only day of the year that women visit their mothers! John says: For many Westerners, the Christmas decorations and carols trigger fond memories of the holidays. For me, watching my mom cooking for the feast and the smell of the fireworks puts me in the spirit. Fireworks, board games, kites, rich symbolism, frugality, the importance of mothers and family time! In Russia, GMT+3:00, we meet Elena Michalski and Svetlana Ruth. They tell us their stories. In Russia, the New Year holiday trumps even Christmas in importance, and major celebrations take place all over the country in recognition of the day. The New Year began to be recognized after Russia made the switch from the Julian calendar (still recognized by the Orthodox Church) to the Gregorian calendar followed by the West. The decorated evergreen trees are called “New Year’s Trees” in Russian. 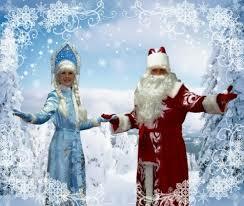 A cultural icon of this holiday is Ded Moroz (Grandfather Frost) who along with his granddaughter Snegurochka comes to visit children and hand out presents with the help of woodland creatures. In addition to dressing up as snowflakes or baby bunnies, children must memorize a poem or a song to recite for Grandfather Frost at a party in exchange for a small gift. The celebrations start at about 11 pm, when the family is seated at the festive dinner. Shortly before 12 pm they toast “for the old year,” remembering and paying tribute to the good things it brought about. There is a whole range of beliefs concerning the celebrations of the New Year. The most famous saying asserts: “As you meet the New Year, so will you spend it.” Everyone does his or her best to celebrate this decisive holiday merrily and in the hearty company of friends and family! Russians feel that if any wish is made on this eve it will surely be fulfilled. Kuranti, the Kremlin clock’s bells, ring at midnight and everyone watches it on TV. The New Year begins with kisses, champagne, and making wishes. Traditionally, many New Year’s parties are costume parties. To reflect on the good things of the past year and to spend New Year’s Eve the way you want the entire new year to be. We keep going West, and see Greece, the cradle of Western civilization and of the Eastern Orthodox Church. What will we find here? Catherine Christaki, member of The Savvy Newcomer team, is our tour guide. It is GMT +2:00. In Greece, the holiday season covers Christmas, New Year and the Epiphany. On the day and evening before Christmas and New Year’s, children sing the equivalent of carols (kalanda) from house to house. The songs are accompanied by small metal triangles and little clay drums. The children are frequently rewarded with sweets (well, that’s the “official” version; most of the time they expect money). Greeks usually spend Christmas Eve at home with family members at the festively set dinner table. On New Year’s Eve, they usually wait until midnight and then go to clubs or bouzoukia (no, we don’t break plates anymore) with live music and dancing until morning. Name days are very popular in Greece, so if you know any Greeks called Christos, Christina or Manolis (on Christmas Day), or Vassilis and Vassiliki (on January 1st), don’t forget to give them a call and wish them a long life (“hronia polla” in Greek). 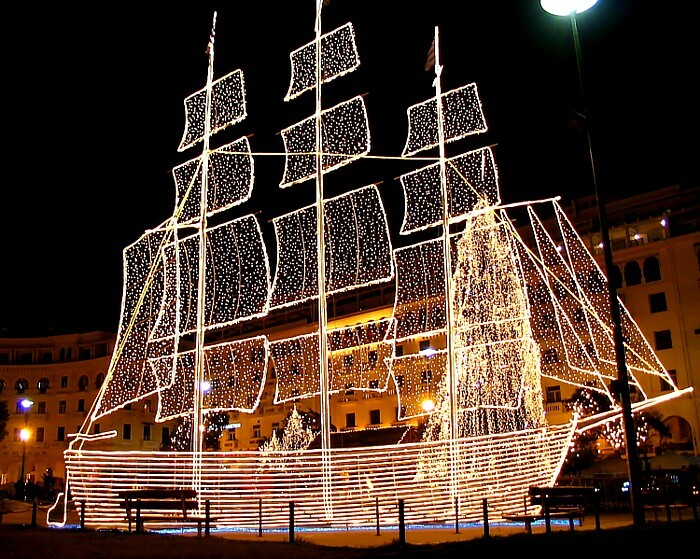 Every December, Thessaloniki, Greece’s second biggest city, erects a huge, illuminated metal structure in the shape of a three-mast ship next to the Christmas tree in its main square, Aristotelous Square. The Greek Festival of Epiphany, or ‘The Blessing of the Waters’, is held every year on January 6 throughout all of Greece. Daring young Greek men and women brave the chilly waters to dive for a cross after it has been blessed by a priest and thrown into the water. For his/her gallantry, the first man or woman who recovers the cross is said to have good luck throughout the coming year. Carol singing. Both on Christmas Eve and on New Year’s Eve. Why do it just once? Children always cheer people up. Epiphany, but with a different meaning than in the West. Greece is Eastern Orthodox, after all! The Savvy Newcomer team gets back on the plane and travels Northwest. Our Swedish friends have invited us to visit. Marie Eriksson is our tour guide. We made it just in time, by GMT +1:00! In Sweden, the Christmas celebration actually starts on December 13, when we celebrate St. Lucia’s day. The story goes that she was a young girl killed for her faith in 304 AD, who would put candles on her head to be able to deliver food to the persecuted Christians who lived in the catacombs in Rome. 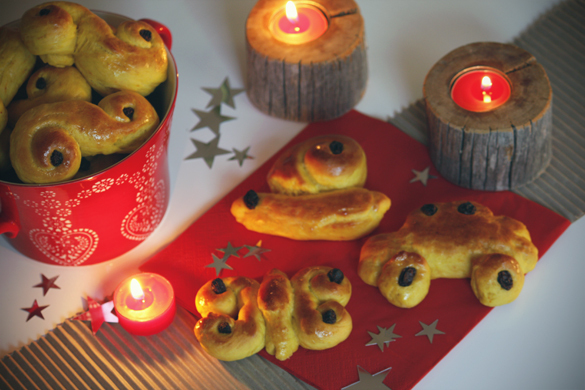 Lucias (girls dressed in white, with candles in their headdresses) march in a procession at school carrying candles and singing about St. Lucia while handing out “Lussekatter”, which means Lucia buns or saffron buns. Lussekatter and “Pepparkakor”, ginger snap biscuits, are hard to miss during the holiday season in Sweden. You will often find freshly baked Lussekatter in almost every Swedish home during the holidays, not to mention every gas station and anywhere else imaginable, along with a barrage of Pepparkakor at every turn! For Christmas itself, Swedish traditions are similar to those of the U.S. and other Western countries. We make a bigger deal out of Christmas Eve (December 24th) than Christmas Day (the 25th). We watch the same Donald Duck (“Kalle Anka” in Swedish) cartoon every year on Christmas Eve and eat the same box of chocolates (Aladdin or Paradis, depending on whether you like dark chocolate or not). We open our presents after Christmas dinner. Santa, or Tomten as we call him, is a mild mannered old man that speaks softly. No loud ho-ho-hos for us. Some families leave out porridge for Santa, a tradition that used to be for the folklore creature tomte that helped out on the farm. Swedish Christmas dinner is called Julbord and features various types of sausages and meatballs, as well as pickled herring, a Swedish delicacy reserved for holidays in most cases. Kicking off the Season celebrating St. Lucia, Donald Duck in Swedish, and Swedish baking. Yum! Our colleague, María Terán Somohano, has been waiting in Mexico. Their celebration starts 9 days before Christmas! The Savvy Newcomer crosses the Atlantic. It’s GMT -6:00. In Mexico we like to celebrate all of our holidays by gathering together and enjoying special meals and dishes. Christmas, of course, is no exception. 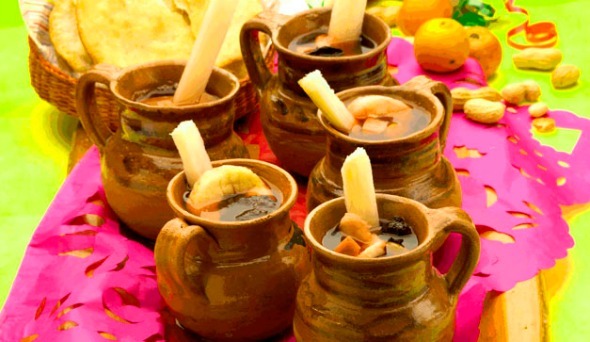 Tradition dictates that 9 days before Christmas, from December 16th to the 24th, people organize parties known as posadas. In Spanish, the word posada refers to a place where someone can spend the night, especially pilgrims. This tradition originally was established in remembrance of the journey of Mary and Joseph on their way to Bethlehem, when they looked for a place to stay, which is where Jesus was born. Nowadays the posadas are good occasions for people to come together and enjoy delicious hot fruit punch and tamales, as well as have fun breaking a traditional piñata. It’s always great to spend time with friends, especially if we’re on a 9-day journey in the posadas! Back at home, in the US, Jamie Hartz and David Friedman, both members of The Savvy Newcomer team, are waiting. They actually coordinated the whole trip! Many holidays are celebrated at this time of year in the United States—Hanukkah, Christmas, New Year—but the biggest holiday for many people is Christmas, which is celebrated officially on December 25 even though Christmastime festivities often begin as early as mid-November. Traditionally, it is the Christian celebration of the day that Jesus Christ came to earth, and today many Americans celebrate it as a holiday to enjoy being with family and giving gifts, no matter what their religion. The biggest cultural icon of Christmas is Santa Claus, who is depicted as a pleasant old man who brings gifts to children on Christmas Eve. 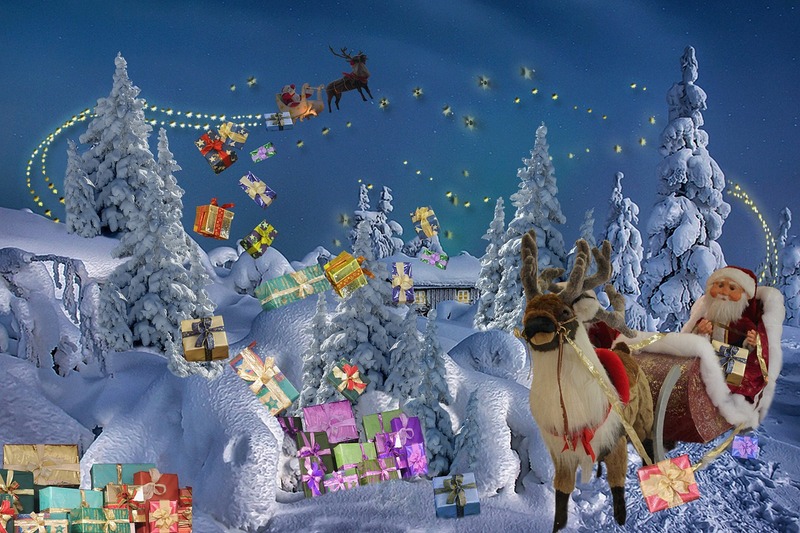 The story goes that children must write to Santa Claus (who lives at the North Pole with his elves, who help make presents, and his flying reindeer, who lead his sleigh through the air) and tell him what they would like to receive for Christmas. If they have been nice during that year, he comes down their chimney during the night before Christmas and leaves presents underneath the Christmas tree in the family’s home. On Christmas morning, the kids are often the ones who wake their parents up, since many families open their Christmas presents as soon as all members of the family are awake. Christmas Day is usually a day for families to get together and give and receive gifts, in addition to enjoying traditional Christmas foods like cookies, eggnog, ham, etc. On New Year’s Eve, it is traditional in the U.S. to watch the ball drop at midnight in New York City’s Times Square on TV. Some Americans who live in Europe have even been known to stay up until 6 a.m. local time to alleviate their homesickness by following this tradition! 2014 has treated us very well and we expect 2015 to be a year of great opportunities! But for now it’s time to take a break so we can come back with a blast in 2015. 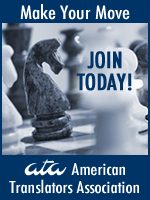 See you in the second week of January, 2015, and happy holidays! This post was a true collaboration of the TSN team and friends! Helen Eby: Captain, leading you through the tour. Jamie Hartz: Tour guide for the US, usually editor. Also, responsible for Day in the Life series. David Friedman: Tour guide for the US, usually editor. Also, responsible for Business Practices series. Catherine Christaki: Tour guide for Greece, usually Twitter Queen, occasional backup blogmaster. Daniela Guanipa: Chief Engineer, aka blogmaster: Makes the blog run, but you don’t usually see the effects except for when she is missing! John Wan: Student of Medical Interpreting in Oregon (Student in the current East Portland cohort that Helen is teaching). Soon-to-be-certified Oregon Court Interpreter! Elena Michalski: Student at Kent State University. Classmate of Jamie Hartz. María Terán Somohano: Student at Kent State University. Classmate of Jamie Hartz.